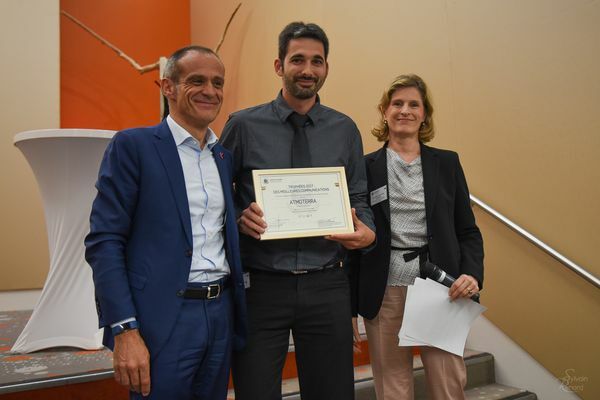 At the General Meeting of the Global Compact France, we were pleased to receive the 2017 Trophy for the Best Communication on Progress, in the category of companies with fewer than 10 employees, across all sectors. 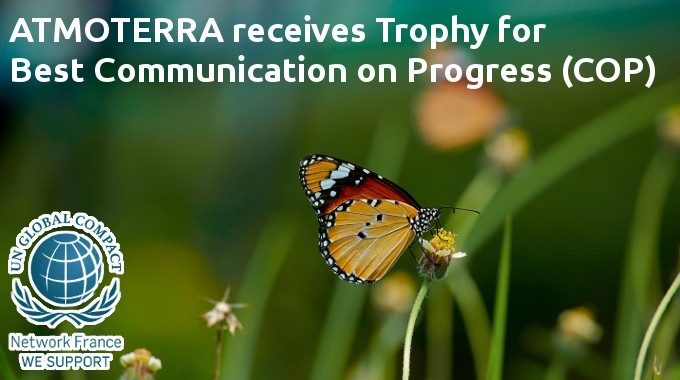 This trophy rewards the commitments made by ATMOTERRA since its creation as well as the quality of its reporting. ATMOTERRA has been a member of the Global Compact since 2014, an initiative launched in 2000 by UN Secretary General Kofi Annan. It brings together businesses, UN agencies, corporate and civil society, around ten universal principles relating to human rights, labor standards, the environment and the fight against corruption. The signing of the Global Compact is a voluntary initiative on the part of companies. You can find our first Communication on Progress (COP), summarizing our commitments and defining our objectives for the coming years. 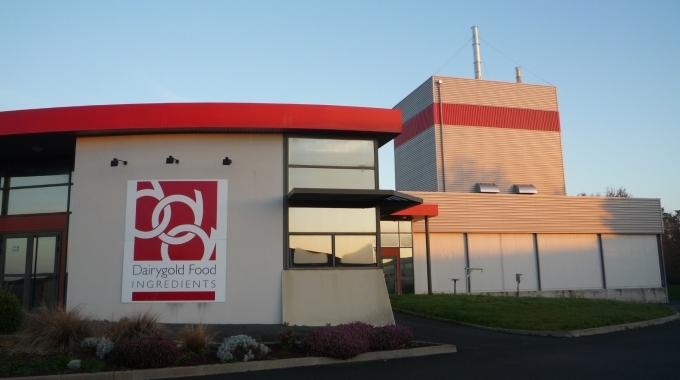 We appreciate your feedback on our commitments and documents. Do not hesitate to send us your comments so that we can continue to improve. 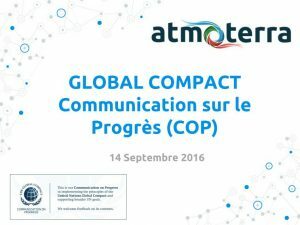 Our COP is also available on the Global Compact France website. The Jury and the Global Compact France congratulate all participants for the quality of the COP submitted and encourages the member organizations to submit their candidature for the next edition. Agathe SARIOGLAN, Commercial center, Scoping, Prize-winner “First COP” category of the 2016 Trophies of the best communications . Global Compact France recalls that all the COPs and COEs of the participants of the UN Global Compact are public on the site unglobalcompact.org. We invite you to consult in this database the communications published by country, sector or year And inspire you. The UN Global Compact brings together companies, organizations, UN agencies, the world of work and civil society around ten universally accepted principles to build more stable and inclusive societies. The Global Compact is the world’s largest corporate social responsibility (CSR) initiative with more than 14,000 participants in 170 countries, and is a voluntary framework, an international repository, a platform for action and exchange. 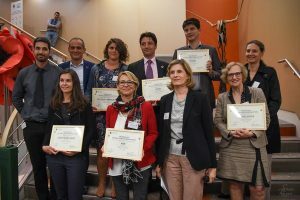 As the official local relay in France, the Global Compact France brings together more than 1,200 companies and nearly 100 non-profit organizations. The Global Compact France offers to all types of companies and non-profit organizations a stimulating exchange place to initiate, develop and share their approaches to social responsibility. The Global Compact is the starting point for any organization seeking to support the Sustainable Development Goals (SDOs) adopted in September 2015 by the UN. These goals offer a universal agenda to be achieved in order to build a better world. 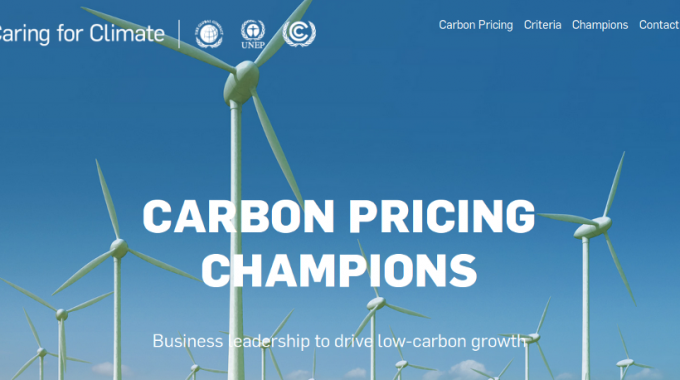 They require a multiplication of corporate commitments, causing profound changes in both companies and markets, thus demonstrating that sustainability and value creation go hand in hand. Photo: Butterfly by Lakshmi R.K.